Registered Emboss = The embossed area is lined up to a particular ink or foil stamped design element. Blind Emboss = The embossed area is NOT lined up to any ink or foil stamped design element. Embossed business cards are for people who want to print business cards with beautiful visual and tactile depth. 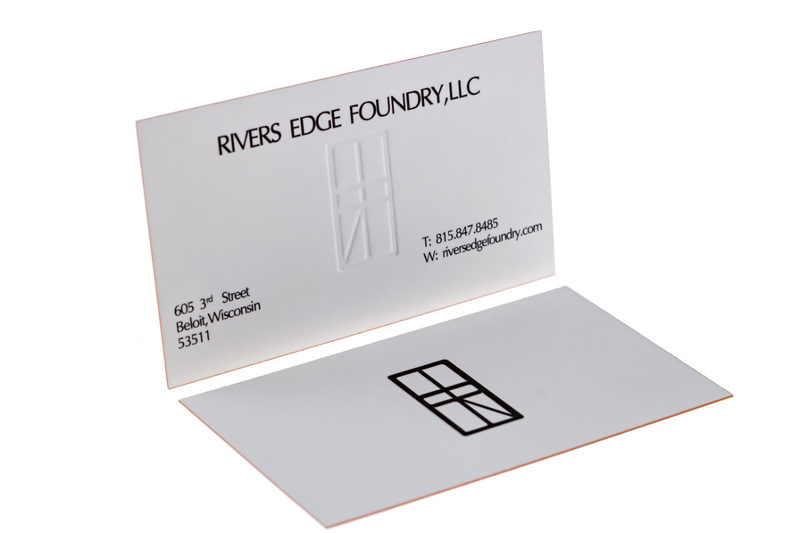 An embossed business card can be registered to ink or foil or be blind embossed. Please Note: On our single-ply papers, like our 18 pt silk, the embossed portion of your business card design will show through to the other side as a deboss. To avoid this, choose our thick business cards with multi-layer papers like: 32pt & 48pt silk. As opposed to our letterpress business cards, which are debossed and protrude down into the paper (away from you), an embossed business card will protrude upward (toward you). Please be aware, due to the absorbent nature of cotton paper, FULL COVERAGE printing on this stock can have issues such as color fading and splotchy or uneven prints. Depsite these issues cotton paper has a very unique feel ,texture, and porous quality that many of our customers like and use as an alternative to letterpress printing. If you like cotton paper, but are concerend with the color issues we recommend that you consider using a different paper stock or send us your files for evaluation. My business cards were a little complicated so I was nervous of how they would turn out, but they turned out just as I imagined and I am so excited about them!!!! This is the best site ever and I will never use anyone else!